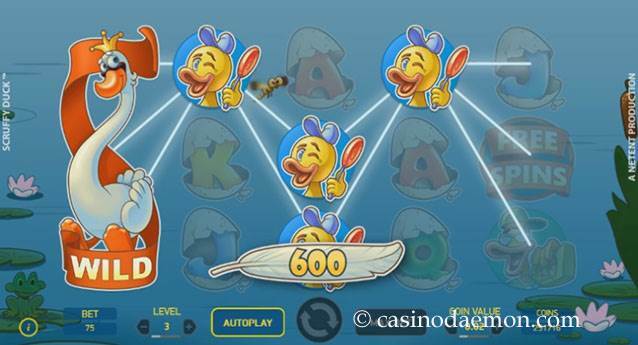 Visit Scruffy Duck at the pond in this entertaining Netent slot. The game focuses on an uplifting theme, set at a pond, with a funny duck family in the centre of the action. The music is playful and instantly creates a good mood. 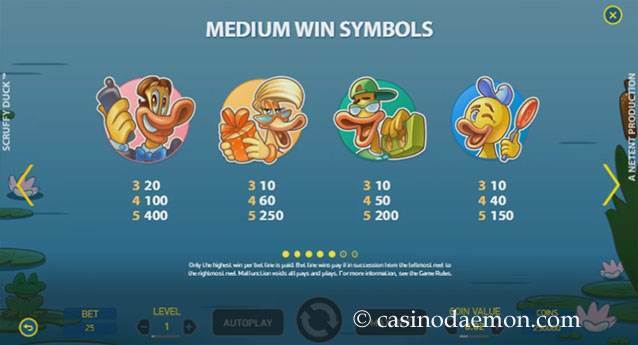 What makes this game special are the many different special symbols and features that include stacked symbols, expanding wilds and free spins with special boosters. The variance of the slot is low to medium, and you will probably get regular winning combinations, but more often with smaller amounts rather than large amounts. You can win most money in the free spins, especially as it has added features that can lead to much higher winnings than in the base game, and it is therefore a game that you should play for a little while, at least until you manage to start the free spins. The theoretical return to player is 96.38%, which is average for an online casino game. You can also play Scruffy Duck mobile, as the game was developed in HTML5 and is supported on many different devices. You can play Scruffy Duck for free on this page, and try the demo version of the game without any risk of losing real money. You can play the slot for real money in the casinos mentioned on this page. 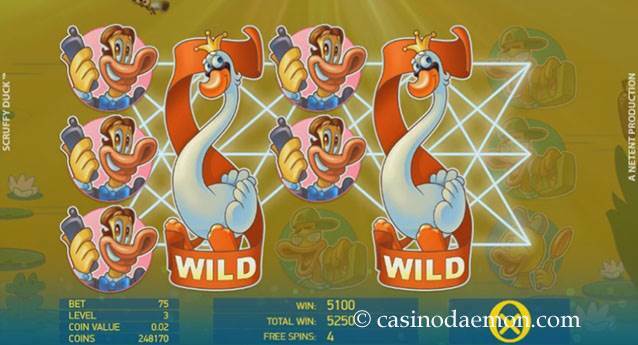 The special symbol of the game is the swan that acts as an expanding wild symbol and can replace any symbol for a winning combinations, except for the free spins symbol. Once it appears on the screen and will automatically expand and cover all positions on the reel. 6 free spins with the double feature, which will activate two randomly chosen special features for the duration of the free spins. 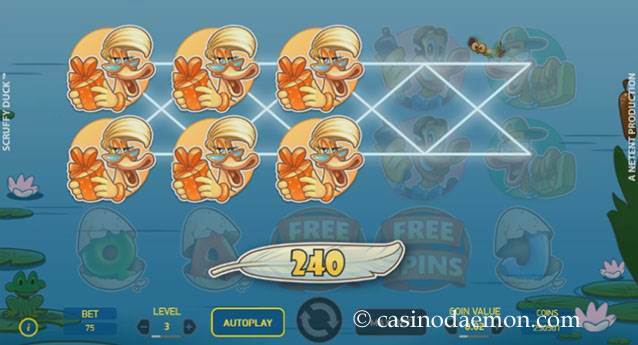 The Scruffy Duck slot has 5 reels with 25 fixed pay-lines. You can play with coin values ranging from 0.01 to 0.25£/$/€, and select up to 10 bet levels. The minimum you have to play one round is 0.25 £/$/€, and you can select bet sizes of up to 250 £/$/€. The game also features automatic play options.